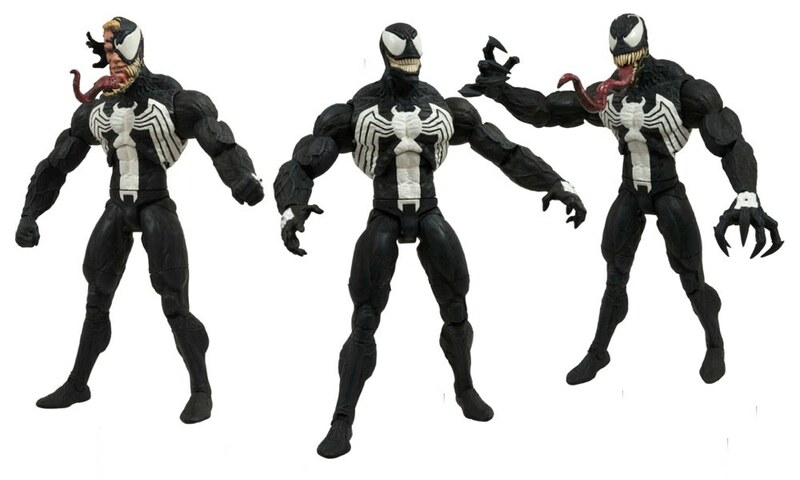 The toy collecting community was thrown for a loop recently when Diamond Select Toys unveiled their upcoming Marvel Select figure of popular Spider-Man foe Venom. Instead of a decorative display base -- a common accessory to most standard-sized Select figures -- the early 2013 figure will come with a variety of interchangeable parts to re-create several of the anti-hero's more popular looks over the years. With 72 different display configurations, it's the most versatile Select action figure ever made, and each combination of parts is a masterpiece in its own right. The sculptor behind the figure is frequent DST collaborator Jean St. Jean, and he took some time out of his busy sculpting schedule to talk to us about the method behind the Madness. 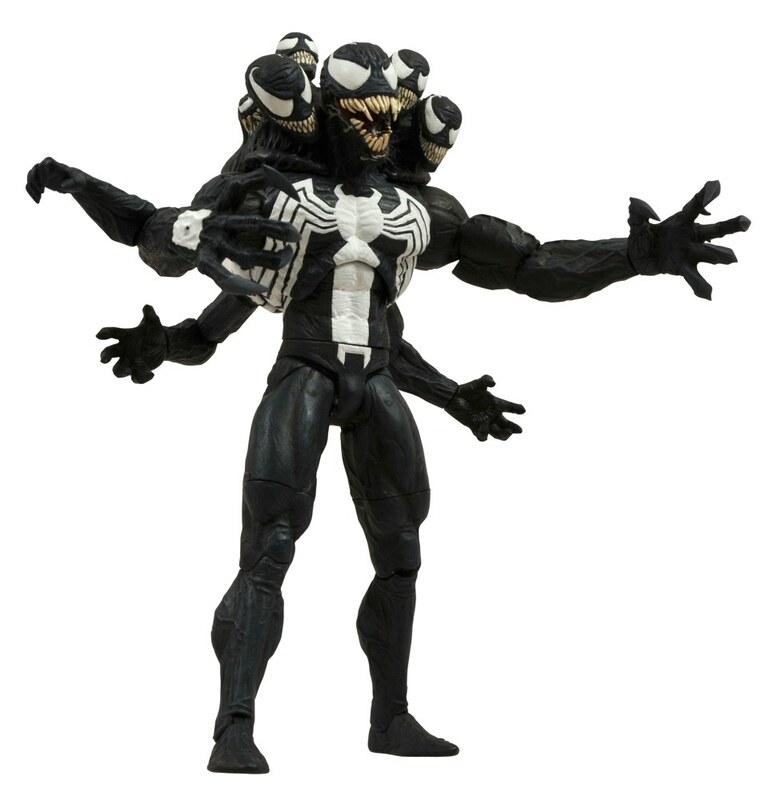 Where did you get the idea of sculpting multiple looks for Venom, instead of making a diorama-style base?JSJ: Chuck (Terceira, director of DST) suggested the idea while were talking about what to do for a base, since we had done the debris base with the exploding symbiote for Anti-Venom. I like breaking outside the established format once in a while just to keep things fresh. What was the most challenging aspect of this kind of figure?JSJ: The tough part was deciding what iterations would all work off one body. The best solution was to do the classic body type, which was the really big wrestler-type body, really more of a style-guide Venom, if you compare him to Spidey as originally conceived. Then, as I always do, I make sure he relates to other MS figures and also fits with the range of MS figures Ive done in terms of scale. So, again I refer to the books and see how he should look next to Anti-Venom. So I came up with two sets of normal hands (open and fists), huge transformed claws, the Lethal Protector head version with removable tongue, transforming Eddie Brock head, the Todd McFarlane-style head, and the attachable back enhancement for the Madness version with all the extra arms and heads. Do you have your own library of Marvel reference at home, or do you rely primarily on the web? JSJ: I have a ton of stuff. The irony is its easier to go to the comic shop and wipe out a section of trades and graphic novels than sift through my collection for reference, and the internet isnt always the most comprehensive resource. Plus I like to re-read a lot of the old stuff to get my head into the character again while Im working on it, so that theres a logic to my decisions that is directly drawn from canon material. 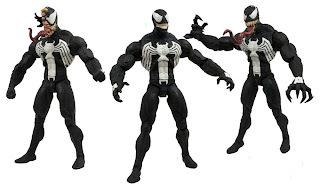 Which one of the Venom looks do you like the best? JSJ: Im really happy with the diversity and the way they all turned out, but for some reason I think my favorite is the simplest: the Todd McFarlane one. The bulbous head with the huge creepy grin really grabs me, and I dont think its ever been rendered accurately. Which was the hardest to interpret? JSJ: The trickiest was how to make the Madness version work as an articulated accessory piece that was removable. It needed to look good on its own and not affect the other versions of the body when not assembled. Plus, I wanted it to be very functional. You've brought your own aesthetic to a lot of the figures you've done -- do you enjoy the challenge of interpreting a specific artist's style, like McFarlane? JSJ: As a lot of people know, I worked for Todd for almost seven years, most of that as his head sculptor, so Ive had pretty extensive experience interpreting his aesthetic. In general though, a comic drawing, as good as it may be, has to be interpreted to make it work as a 3-D sculpt. Also there are areas that, in my opinion, need to be enhanced to make the sculpture more interesting and thats where I fill in the blanks with my own touches. Specifically on the symbiote clan, Ive done Carnage as a statue and Anti-Venom as a figure, and I wanted to differentiate between all their textures when approaching the Eddie Brock Venom. How do you decide what types of joints to include in a figure? Do you prefer joints that will preserve the integrity of the sculpt, or do you think about poses you want him to hit? JSJ: Articulation is always a case-by-case basis, but lately Ive been squeezing in as much movement as possible. In this guy we actually switched gears a little, in that no one was really thrilled with the usual MS hip ball joint look, so we decided on the compound hinge which we had used extensively in our Battlestar Galactica figures and was recently used on the Avengers Movie Hulk by Gentle Giant. Is there another character you'd like to interpret in this format? Mr. Fantastic, Sandman, Iceman, Carnage, etc.? JSJ: Obviously, Carnage would be awesome to round out the symbiotes in action figure form with my spin on it, but Id LOVE to do Iceman, we could do something really sick with him.